Inclusion of eggs in the scheme varies from state to state, depending on political dispensation of the moment and food habits of the local population. New Delhi: As the political situation in Chhattisgarh changed, so did its food regimen. The Congress government in Chhattisgarh Tuesday decided to reintroduce eggs in its school mid-day meal scheme after a hiatus of nearly 13 years. Eggs remain a controversial ingredient in the mid-day meal scheme (introduced across the country in 1995) for various reasons. These range from the BJP’s aversion to eggs because of their “upper-caste vegetarian interests” to lobbyists who dispute their nutritional value. Their inclusion in the mid-day meal scheme varies from state to state, depending on the political dispensation of the moment and the food habits of the local population. As of today, besides Chhattisgarh, 12 states across the country serve eggs, according to the Right to Food Campaign (2015) — that is less than 50 per cent of India’s 29 states. Eggs were first served to children in Tamil Nadu in 1989 as part of a mid-day meal scheme, even before the scheme became a national phenomenon. In November 2001, the scheme was regularised across the country by the Supreme Court. However, in the same year, under the aegis of the Jayalalithaa-led government, eggs disappeared from the menu in Tamil Nadu due to problems of quality and quantity. The state government reintroduced them three years later. Similarly, in states like Jammu & Kashmir, Jharkhand, Arunachal Pradesh, Assam, Tripura, Telangana, Kerala, Odisha, Bihar and Jharkhand, the supply of eggs has varied, and even been stopped at times. The Jharkhand government has reportedly reduced the number of eggs allowed per child per week from 3 to 2 due to rising prices. BJP’s aversion to eggs means that only 5 of the 17 states governed by BJP and/or allies provide eggs to children. The Shivraj Singh Chouhan-led BJP government in Madhya Pradesh had courted controversy in 2015 when it shot down a proposal to serve eggs in angandwadis. “BJP states are most likely to resist the inclusion of eggs for reasons related to the sentiments of vegetarians,” states an IndiaSpend report. However, a few non-BJP states (Punjab, Mizoram and Delhi) also do not serve eggs, but not because of religious considerations. States’ aversion to eggs is contrary to the National Institute of Nutrition prescription making it compulsory since they are considered a cheaper, safer, more nutritious and easier to procure source of protein. BJP has often been criticised for not providing enough protein but catering to upper-caste vegetarian sentiments instead even when 70 per cent of Indians eat non-vegetarian food. “… time and again, religious and caste considerations of the majority — or should it be minority given that some estimates show only 23 per cent of Indians are actually vegetarian — are allowed to come in the way of a child’s health,” an editorial in The Telegraph from December last year said. Lok Sabha Speaker Sumitra Mahajan came under fire in 2016 for reportedly promising Acharya Vidyasagar, a Jain saint, she would keep mid-day meals “egg free” across schools in Madhya Pradesh. Last year, one of the largest suppliers of mid-day meals, the Akshaya Patra Foundation, in Karnataka decided to keep their meals garlic and onions free, too. 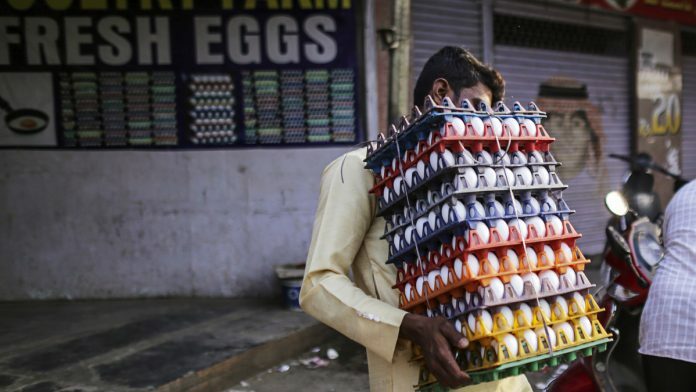 Now that Chhattisgarh serves eggs, will Congress governments in Rajasthan and Madhya Pradesh — where a strong lobby has continuously blocked eggs — follow suit?